I definitely couldn’t make hippos for a living…I’m very slow. But you can see she’s well-loved. She was snatched from my lap several times before I even had the chance to get those eyes tacked on, hence the wobbly-eye look. So go to your local library and search those dusty shelves. Somewhere between ‘making dolls’ and ‘fancy embroidery’ you’ll find a wealth of old patterns waiting to be discovered. oh how cute!! and..a great idea about the good ol local library. i hate to admit it, but i don’t think i even HAVE a library card! ugh! **put library visit on list of things to do!**loves! Eeek! Giggle! What a fun pattern! Great work! Wow, that hippo is adorable!! very cool! I’ve GOT to start looking at craft books at the library. FUN!!! adorable! she (?) looks so sweet, and there’s nothing like a well-loved piece of work! i have that anne dyer book, it’s a good one. my local library used to have a huge annual book sale — i miss it so much but i treasure what i got in those days! vintage craft books are just fabulous. Love the hippo! Do you remember which of those books it was in? Oh so cute! I’m a huge fan of the library. How completely cute!!!!! I really really love the fabric she’s made of, and you did an awesome job. I may have a new obsession of going to look for old pattern books now. Who cares if you’re slow, that just means you’re taking extra care, obviously. Oh my goodness. Do you remember which book she was in? I’d love to see if my library has it. 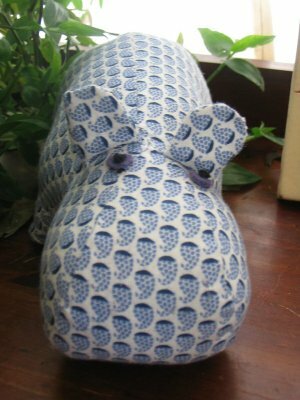 I have a little friend who is ga-ga over hippos; could you email me? You did a *great* job, by the way! That’s a great hippo! The fabric you chose is so cheery! I wish my library had wonderful craft books like yours does! 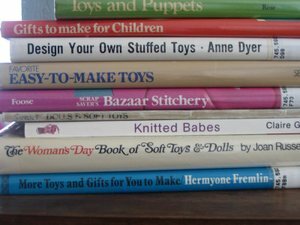 I’ve researched my library but couldn’t find many toy making books. 🙁 I’ll have to ask the librarian for help next time. I can’t blame your little one for snatching that hippo before it was quite ready. It’s totally adorable! Your hippo is too cute! I love the big snout! She’s *wonderful*!!!! And I just love the library as a source for inspiration – first and best of all, it’s free (which is important if you are the thriftiest girl in the world!) and also b/c they have such a wealth of older books that have long been forgotten. Some of the older books are so out of date that it’s all good again! You did a beautiful job on MissHipHip! The “wobble eye look” is just part of her immeasureable charm…. 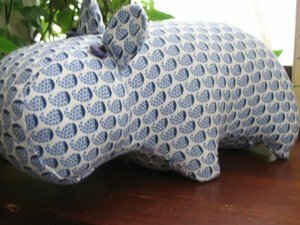 The pattern might be old but that fabric makes your hippo totally cool. How clever. I WANT ONE! That hippo is really cute. 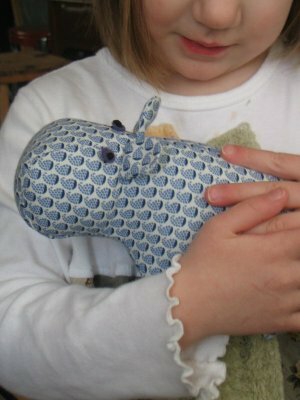 I love that you can make stuffed animals, I’m going to start a 10 week sewing class in a couple weeks, so maybe one day I can make cool hippo’s too. Next Next post: Pack Your Bags!